-The plate attaches easily to a wall, vertical stud, or secure overhead beam. -Durable and weather resistant to be installed indoors or outdoors. -Turn any room or any space into a home gym. -Perfect for exercises involving suspension trainer bands, straps, rings, etc. 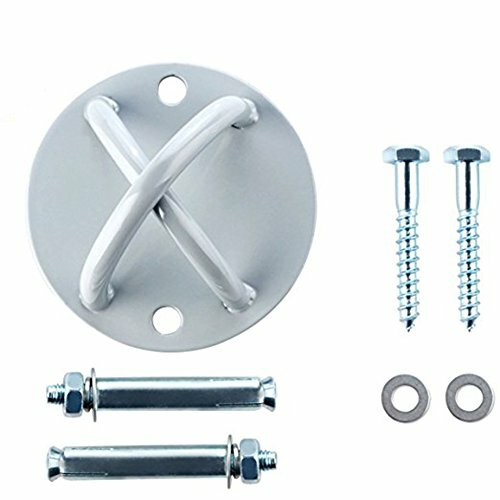 CONVENIENT MOUNTING - 2 sets of screws are included so that you can install ceiling mount on wood or on concrete. X-mount is perfect for suspension straps, yoga swing, gymnastic rings, boxing equipment, battle rope, yoga swing and more! Premium quality material, super strong and ultra durable. X-mount can safely support up to250kg, the size is 12x12x6cm, the thickness is 3mm. If you have any questions about this product by Beststar, contact us by completing and submitting the form below. If you are looking for a specif part number, please include it with your message.